Avinash Jalani was born in Rajasthan (India) and now is settled in Australia with his lovely wife Olivia and his son Akash. He is an enthusiastic hiker, bush-walker and believes in soul-healing through meditation practice. He has been writing poems from early childhood in form of words then sentences. These poems were his refuge into self and strengthen his inner voice. 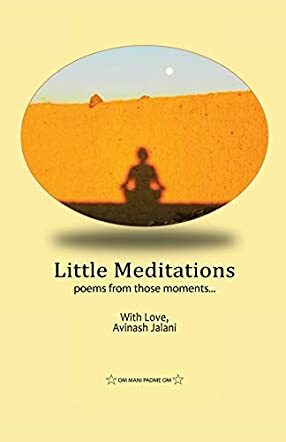 Little Meditations is a collection of poems written in the moment, by Avinash Jalani, who is on a journey to rediscover the connection with this universe through collective love and soul-healing. These poems resonated from him during moments of self-reflection, struggle and stillness experienced in day-to-day living, which led to sharing this book with you which goes through phases from being social animal (human in other words) to spirituality, eventually to be at home in love. This is a humble attempt to make us realise that we are a gift of this universe and here to sing our song. Reminds us to breathe at this moment in surrender. Melt your longings and allow life to shine through. You are not alone and healing starts with self. Little Meditations is a work of inspirational poetry by author Avinash Jalani. Part spiritual and part meditative, this mid-length collection of poetic works is intended to inspire healing and mental well being by exploring various forms of self expression. The collection chronicles the author’s own journey of exploration, channeling different emotional moments in his life to illustrate the futility of resisting those feelings. By letting go and allowing them to wash over you, just as the poems do, the author attempts to offer a reminder that our existence in the universe is unique, to be celebrated and cherished. Because poetry is such an insular and isolated form of writing, it’s rare to find poems which can successfully mix the self help and meditative genres with deeply personal explorations of feelings, but Little Meditations manages this tricky balance very well. Avinash Jalani makes a clear attempt to explore every facet of human emotion during the pages of his work, travelling from times of great stress and sadness to concepts of relief, loss, extreme happiness and slow, silent calm. I felt his expressions and use of text conveyed these emotions very well, and I could see clearly how they could be applied to someone else trying to work their way through similar moments. In reading about Jalani’s own self reflection, there is clear opportunity to do the same for oneself, and the overall message is one of harmony and calm which I took to be very comforting. Little Meditations was an enjoyable read. Little Meditations by Avinash Jalani is a collection of poems that tackles the diverse emotions of day to day life. The thread of spiritual undertones that runs through the entire collection speaks about awakening, love, and healing. The poems in the collection speak about the daily struggles of life. The poet’s desire to connect many of these emotions to nature and knit them together seamlessly make his words effective and clear to readers. The eclectic combination of nature, human emotions, spirituality, and positive vibes make this an interesting collection that will help readers contemplate and reflect on the vagaries of life. The poems are insightful and profound and each poem has a different message for readers. All the poems have their own charm and they will help readers to look at the world and their emotions with a new perspective. The poems are simple to comprehend and honest, though the underlying messages are deep and will make readers want to enlarge the images portrayed along with capturing the spiritual vibes. The concept of having photographs in the book makes it colorful and they silently validate the author’s outlook of the world and how he interprets it. Readers will find themselves drifting through the words and emotions, and embarking on a spiritual journey that will take them ‘Searching the path in astral, reaching an ethereal point, no wish to know the unknown, healing in surrender.’ The collection is for all readers who want to reconnect with the Universe and to surrender to its abundance, wisdom, and spirituality.